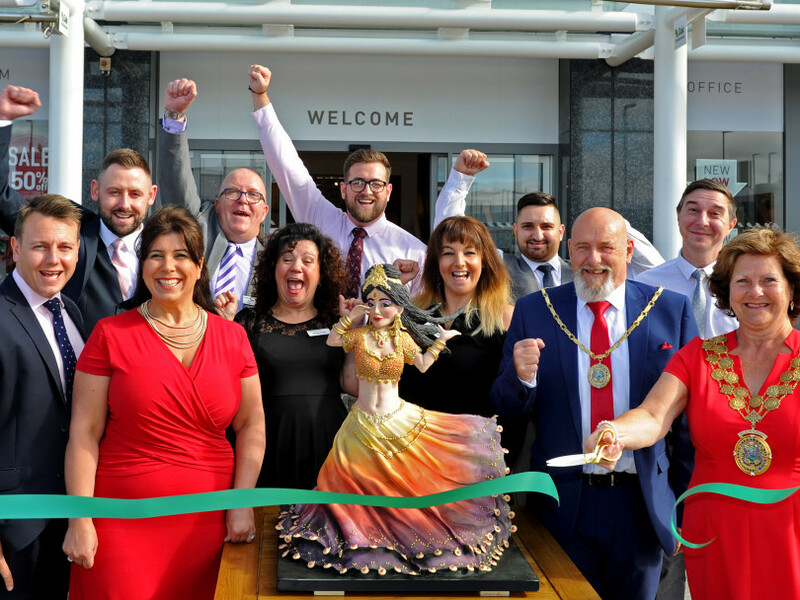 Oak Furniture Land donated a spectacular cake in the shape of a Bollywood dancer to support a multicultural fundraising event at the opening of its store at Birstall Shopping Park. Oak Furniture Land commissioned the three-foot confectionery creation to celebrate its new store opening and donated it to fundraisers from the charity Batley Cabaret Show. The store was officially opened by Mayor of Kirklees Coun Gwen Lowe. Batley Cabaret Show fundraisers took centre stage alongside the Mayor as the new Oak Furniture Land store team presented them with the cake. Located at Birstall Shopping Centre, the 14,632 sq ft furniture store includes a mezzanine floor and is one of the first stores in the UK to showcase Oak Furniture Land’s new store layout. Andrew Fletcher, store manager at Oak Furniture Land Birstall, said: “We are delighted that the Mayor of Kirklees officially opened our new store and welcomed customers through the door. Fundraiser Tracey King said: “I was thrilled to take part in the official opening of the new Oak Furniture Land store at Birstall Shopping Park. “The Bollywood dancer cake donation was a wonderful gesture to support and highlight our multicultural fundraising dinner. “The multicultural evening featured a multicultural buffet, red carpet entrance and entertainment from the Batley Poets, a group of diverse poetry writers and performers. The amazing cake sculpture was created by Rose Dummer (aka Rosie Cake Diva) from Channel 4’s Extreme Cake Makers.